Macy’s One Day Sales and Weekly Ads. Find the best Macy’s bargains and money-saving offers & discounts. Shop in store or online – Free Shipping on all $25 orders. 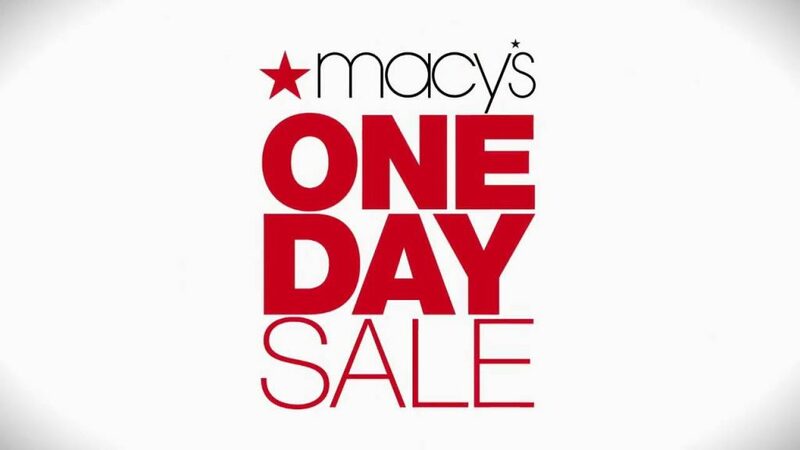 Macy’s One Day Sale April 2019 – Shop online: Karen Scott Lounge Zip-Front Jacket, Only at Macy’s; Clarks Collection Women’s Helina Amo Mary Jane Flats; Cushion-Cut Diamond Promise Ring (1/4 ct. t.w.) in Sterling Silver; Bar III Midnight Blue Slim-Fit Suit Separates; Home Design Mattress Pads; and more. Take 20% OFF – up to a total of $100, and Rewards for qualifying purchases, with the Macy’s Credit Card. Macy’s Sale Ad: Alessia Leather Sofa Living Room Furniture Collection; Kenton Fabric Sofa Living Room Furniture Collection; Liam Fabric Power Motion Sectional Sofa Living Room Furniture Collection; Sanibel Bedroom Furniture Collection; Charter Club Damask Bedding Collection. 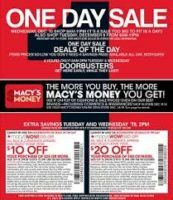 Macy’s Sale Ads and Best Deals – Macy’s One Day Sale April 2019.